Stuart Bocking is on the air tonight, so I sent him an email about the dream he appeared in on the weekend. His joking reference to it being a nightmare could be prophetic, because the other dream of interest I had over the weekend could very easily be considered a nightmare. More on that tomorrow. It seems mildly odd to me that I can write about this here, addressed to nobody in particular, on a public blog which will be indexed by Google within the next few hours and be very difficult to ever completely remove from the Internet, and yet I have avoided mentioning this to anybody else, even completely omitting it from the list of things that happened on the weekend when asked by people I can confide in. I hesitate to use the word “major” in front of “depressive episode” because I don’t think it quite fits the clinical definition…it was an episode, a fairly serious one, but I’m not prepared to call it “major”. What am I talking about? The events of Sunday morning around 4:30. I don’t remember the exact time, but what I do remember is that in the space of about five minutes, and for no apparent reason, I went from being in a relatively good mood, to being depressed enough to have to fight off the urge to visit a publicly accessible building of suitable height. In the end, the best thing I could do was make myself go to bed and sleep. It took a long time to get to sleep, but I felt a little bit better when I awoke. I didn’t really fully come out of the depressive episode until late last night, and to be perfectly honest I’m not entirely sure that I’m over it yet, but I suppose I can be pleased with the fact that certain buildings don’t seem as appealing as they once did. As I said, this all happened for no apparent reason…perhaps I’d just been un-depressed for too long, considering that I had a relatively good week and it had been a week or so since I noticeably felt depressed, it’s a workable theory. Otherwise I’m confused. I like to understand things, and the fact that I can’t understand why I suddenly took a nose-dive on Sunday morning concerns me. Will I finally seek professional help, probably not. Should I be seeking professional help? Most likely, but how exactly do I force myself to do so when I would rather not have any interaction with any human being while I’m depressed, and I don’t seem to want help when things are going well? If there is one thing I seem to be very good at, it’s getting myself in to situations that I just can’t manage. I count three of them at this point in time, two of them are my own fault, and one of them (this one)…well I wouldn’t be surprised if it has something to do with the other two…in fact I’m almost certain it’s related to at least one of them, but now I’m being intentionally vague and defeating the purpose of writing this publicly. This article is long enough…and once again, writing like this has been mildly therapeutic. 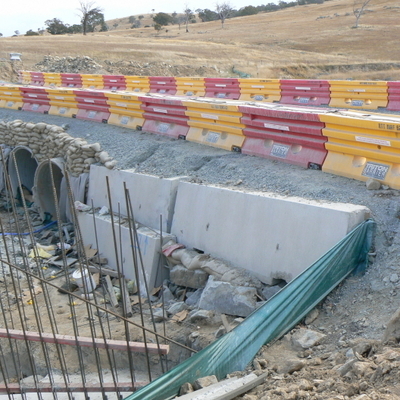 A bridge on Old Cooma Road is currently being upgraded, and I decided to stop and take some photos of it. 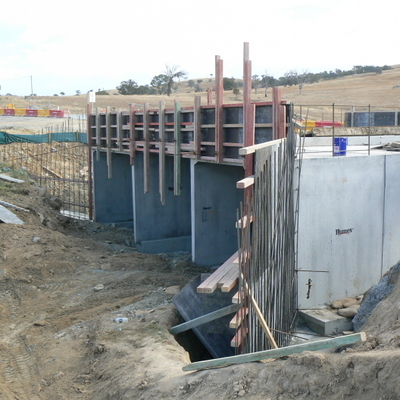 The full set of photos can be viewed on the photo gallery at http://photos.samuelgordonstewart.com/OldCoomaRoadBridgeUpgrade however I’ll share a couple of them with you here. 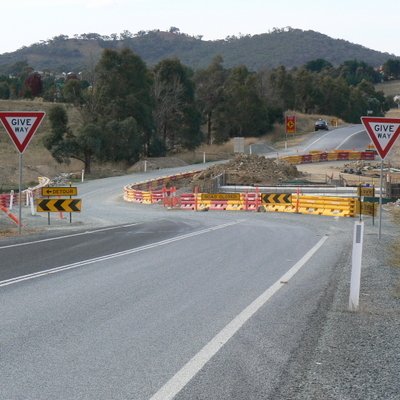 The temporary detour bridge. I’m surprised that it remains stable. 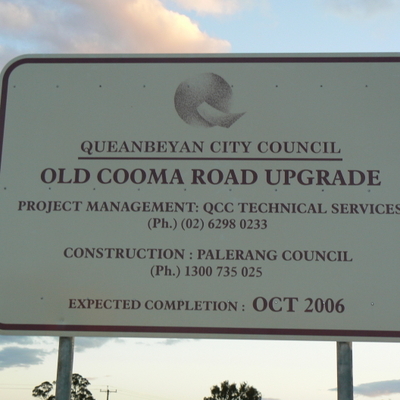 Would anybody (who hasn’t already been told by me) like to guess where I was going on Saturday that required me to travel along Old Cooma Road? I took plenty of photos of my destination, and as a clue, I intend on visiting similar sites in the coming weeks to take photos of them. Anybody? How I wish 2UE’s Stuart Bocking had been on the air last night so that I could inform him of a dream I had in which he made a guest appearance on the weekend…although guest appearance is probably the wrong description, he was the main character. The dream took place in the cereal aisle of a supermarket. It started with Stuart looking at some boxes of cereal, picking them up, shaking them, and putting them back on the shelf. He was then approached by about a dozen people complaining about how the boxes of cereal were only half full. Stuart proceeded to pull a microphone and some scales out of his pocket and run an impromptu radio program on the subject of cereal companies scamming customers. Oddly every box that Stuart weighed came up with the same measurement on Stuart’s scale, regardless of box size…”half full”. I’m not sure how the scales determined that. The manager of National Cereals just happened to be in the aisle and Stuart cornered him for an interview, during which he was informed that the cereal boxes were being filled correctly in Armidale, and that the supermarket staff must be stealing the cereal. The manager of the supermarket then rushed over to deny the allegations that his staff were stealing the cereal, and went on a peculiar rant about how “the boxes weigh the right amount if they’re upside down and you don’t read the weight printed on the box…oh and did you know that we’ve increased the price of oranges so that you get one for the price of two”. The dream ended quite abruptly at this point. Better late than never. This week’s award goes to John Farnham, and I’ll save “Sadie The Cleaning Lady” for another week, as this week’s feature song is “Pressure Down”. It’s funny how wrong it is possible to be about the lyrics of a song until you read them. In this case I could never make sense of the lines “Take the pressure down, ‘Cause I can feel it, It’s rising like a stone” until today when I realised that I had managed to get it wrong for a very long time, as you will see below. I was watching Underbelly last night and noticed something that I thought might interest you. At one stage during the show two of the characters were sitting in a car listening to Derryn Hinch talking about the latest gangland killing on your sister station 3AW. The radio was shown, and it said that they were tuned to 693 on the AM dial, however as the entire series is set between the years of 1995 and 2004, this isn't possible. During those years 3AW was broadcast on 1278 AM. They only moved to 693 AM on the 1st of May 2006 in an effort to improve their reception in some parts of Melbourne. I hope you have a good long weekend, and a very dignified ANZAC Day. This week’s award goes to George Harrison, and the feature song is one of my favourite George Harrison songs, one which was played by Mike Welsh when he filled in for John Kerr on 2UE on Sunday, “All those years ago”. As Mike said on Sunday in reference to The Beatles and George Harrison, “you know it’s a good band when even the drummer can have a successful solo career” (paraphrased…or perhaps he said something slightly different and I misheard it). They’ve forgotten all about mankind. I send out a prayer to you. He’s the only reason we exist. Whoever is responsible for organising today’s Canberra leg of the Beijing Olympic Torch Relay is clearly doing a fantastic job at applying to be come to become the head honcho in the Department of Inconvenience. Starting the torch relay during peak hour and closing roads as they see fit during this time is a stroke of genius. Making everybody who lives or works in or around the road closures leave very early for work, and forcing extra traffic on to arterial roads which were cleverly opened with one lane each way along various parts of the road is also very clever. And as if last night’s 6pm fireworks weren’t enough (they weren’t inconvenient) there had to be another set of fireworks at 6am today. That was a very inconvenient wakeup call, as was the 45 minutes of bird hysteria which followed it. The helicopter which has been in the air for about the same amount of time and flew directly over my house at 6:30am was also very inconvenient. I’m just glad that my working day does not start in the normal place today, because otherwise I would be leaving for work at about 7:40am to ensure that I am out of the area before the random rolling road closures, and before everybody else has the same idea and clogs my alternative routes. After the drawn AFL match on Sunday, Tim Watson on Channel Seven was arguing the point for golden point extra time, but I can't really understand why. I like the idea of having a draw and in the case of Sunday's match I think it was a fitting outcome. The Bulldogs clawed their way back into that match a couple times, and at the end Richmond just couldn't get ahead again. I really think that Golden point is a cheap and nasty way to end a match for the sake of having a winner. I much prefer the draw, or in cases where a result is needed such as a final, a fixed period of extra time followed by a penalty shootout if the scores are still deadlocked. Channel Seven’s “The Morning Show” has just been renamed “Sitting On The Couch with Larry and Kylie” by Dorothy, one of Clinton Maynard’s callers on 2UE this morning. Apparently she watches it on Thursdays. If this, and the callers Stuart Bocking had about an hour ago (one whinging about his licence and registration being suspended while he was overseas for five months, because he deliberately did not pay two parking fines before he went away, and the other caller who was going on about something to do with running out of fuel for his heater and some competition running on another radio station…although most of his words were merged with the next three words so I missed most of whatever he was talking about) are a sign of things to come, this could be a very amusing night. “He’s seen the team hypnotist” said Dennis, in reference to a player who took a mark, instantly turned around and kicked a goal, the latter two actions almost without looking. I was quite interested in Dennis’ appearance on the SBS genealogy series “Who Do You Think You Are” earlier this year. I have been planning on writing him a letter about that for a while…I really should do that soon. I am writing this to inform you that I have decided to close this blog, mainly because I no longer have time to adequately maintain it. I have been considering this for some time and I have finally come to the conclusion that it is the right decision. To briefly summarise my reasons, I have lately had an ever-decreasing amount of free time to dedicate to this site, or my other tasks which have a higher priority. The list of things I want to write about is almost longer than my arm, most of it now irrelevant due to the “moment” for most of it passing. I’m struggling to keep up with the regular (eg, weekly and monthly) posts, let alone the standard day-to-day posts which make this blog worth reading. There are a number of things I would like to do with this blog, but they would take even more time than the time I can’t allocate for the current list of tasks. This doesn’t even take in to account the time required to produce podcasts…something I would love to do more of, but just have absolutely no time for. One of my main plans for this year was coverage and analysis of the ACT election. As much as I would like to provide a very intense coverage of the election, and the people and issues surrounding it, I just won’t have enough time to even come close to doing it justice. Ultimately, the only fair things for me as the author of this blog, and you, as a reader who comes here expecting to see something, is for me to draw a line in the sand, and close the blog. The decision has not come easily. I have enjoyed blogging and podcasting for the last three years (OK, so I’m a couple weeks short of the three year mark) and I had a number of plans for at least the next year, and I also recognise that I have been very fortunate with the number of people who read and contribute to this blog, a number far in excess of most personal blogs. I have also had the good fortune of a good Google Pagerank. Closing this blog will effectively mean losing both of these, something which will be quite detrimental if I ever decide to start again. I recognise that this decision is one I can’t really reverse, the effects are permanent even if I do resume blogging at some stage down the track. I would like to thank you for your support over the last three years. A very small number of you have been here right from the beginning, the majority of you joined me more recently. Either way, you have all helped to make this blog what it is. I appreciate your support, I doubt that I would have made it this far without you. For something that started as a journal of my time at Linux.Conf.Au in 2005 and evolved in to a personal blog, the level of interest has been staggering. Admittedly I had some (not always welcome) help in the form of publicity from other websites, many of which no longer exist, and most of the readers of those websites didn’t read this blog more than once, but the number of people who have stuck around is still pleasantly surprising. I will leave this site online for a little while. All the posts and pages will be available via their current URLs, and the site will remain navigable via the category, calendar, archive and other links. In that regard, nothing will change for a while. In the coming days I will replace this “dynamic” database driven version of the website with a static HTML version, with any luck you won’t notice a difference. The reason for the replacement version is that whilst this site continues to run on a dynamic version, any security flaw in WordPress (of which I am currently using a slightly outdated version, and do not wish to upgrade) could result in data loss. The static version will be a complete archive of the site, allowing me to keep a backup copy for posterity. It will also allow me to provide a downloadable copy, in case anybody actually wants a copy. I haven’t quite worked out what I’m going to do with the site after that. At this stage I think I will probably continue to update the photo gallery periodically, I will probably take this website down and just leave the downloadable version. What I will replace it with is something I haven’t decided. I’m sure that I will have some form of online presence to replace this one at some stage. I hope that some of you will find it of some use or interest. Once again I would like to thank all of you for reading and contributing to this site over the last few years. I’ve enjoyed most of it and I hope I have been able to provide you with some entertainment and something to think about. A number of us have failed to eye-to-eye on a number of occasions and I’m sure that I will miss some of the debates which ensued, although my sanity, keyboard, desk and head will probably be thankful for a lack of debates. Many thanks for your interest over the last few years, hopefully I will be able to stay in contact with some of you. Best of luck to all of you. This week’s award goes to Gilbert O’Sullivan and the feature song is “Alone Again, Naturally”. Before I run the lyrics, I should probably say a few words about this song. Some people see it as a suicide song, a description I vehemently disagree with. The lyrics are, admittedly, dark and sombre, but it is a reflection of various aspects of life. The song is certainly not uplifting, but as somebody who has been suffering from depression I can attest to the song making me feel a bit better; whether or not that is because it paints a picture of their being somebody much worse off than me, I don’t know. Parting your soup is not a miracle, Bruce, It’s a magic trick. A single mum, who’s working two jobs, and still finds time to take her kid to soccer practice, that’s a miracle. A teenager who says no to drugs and yes to an education, that’s a miracle. People want me to do everything for them, what they don’t realise is they have the power. You want to see a miracle, son? Be the miracle. Anyway, on with a song I find rather soothing, the song which at this point in time has been on my Musicians Of The Week waiting list the longest, Gilbert O’Sullivan’s “Alone Again, Naturally”.